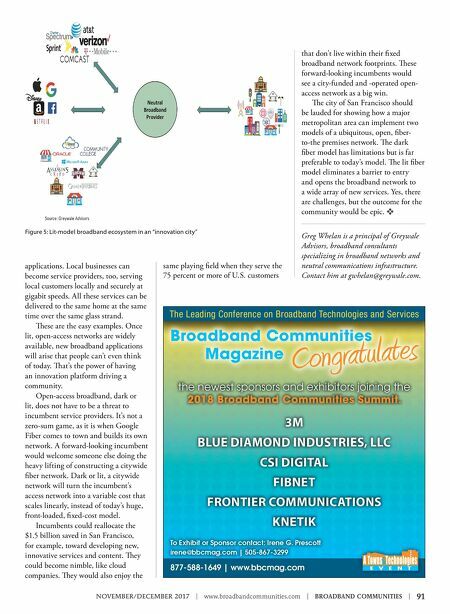 NOVEMBER/DECEMBER 2017 | www.broadbandcommunities.com | BROADBAND COMMUNITIES | 91 applications. Local businesses can become service providers, too, serving local customers locally and securely at gigabit speeds. All these services can be delivered to the same home at the same time over the same glass strand. ese are the easy examples. Once lit, open-access networks are widely available, new broadband applications will arise that people can't even think of today. at's the power of having an innovation platform driving a community. Open-access broadband, dark or lit, does not have to be a threat to incumbent service providers. It's not a zero-sum game, as it is when Google Fiber comes to town and builds its own network. A forward-looking incumbent would welcome someone else doing the heavy lifting of constructing a citywide fiber network. Dark or lit, a citywide network will turn the incumbent's access network into a variable cost that scales linearly, instead of today's huge, front-loaded, fixed-cost model. Incumbents could reallocate the $1.5 billion saved in San Francisco, for example, toward developing new, innovative services and content. ey could become nimble, like cloud companies. ey would also enjoy the same playing field when they serve the 75 percent or more of U.S. customers that don't live within their fixed broadband network footprints. ese forward-looking incumbents would see a city-funded and -operated open- access network as a big win. e city of San Francisco should be lauded for showing how a major metropolitan area can implement two models of a ubiquitous, open, fiber- to-the premises network. e dark fiber model has limitations but is far preferable to today's model. e lit fiber model eliminates a barrier to entry and opens the broadband network to a wide array of new services. Yes, there are challenges, but the outcome for the community would be epic. v Greg Whelan is a principal of Greywale Advisors, broadband consultants specializing in broadband networks and neutral communications infrastructure. Contact him at gwhelan@greywale.com. 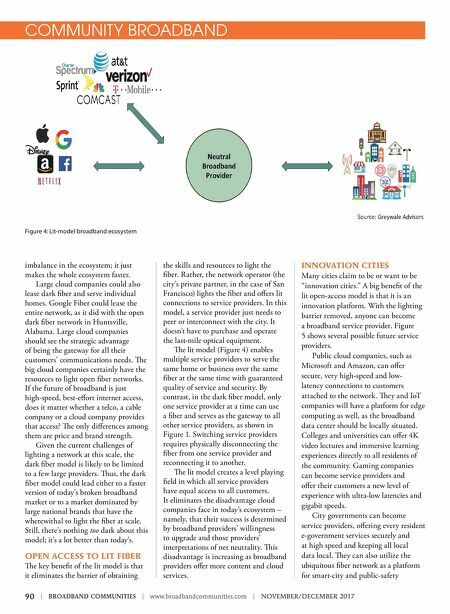 Figure 5: Lit-model broadband ecosystem in an "innovation city"